Now, to one of my all-time favorites, H.P. Lovecraft. The Wizard of Weird is one of the most puzzling figures in literature (no s mall feat) and a most peculiar phenomenon. Hardly read in his lifetime, his stories have since inspired movies, music, video and board games and countless writers. The reclusive author of the Cthulhu Mythos is often overshadowed by the larger-than-life Lovecraft Mythos distilled from his letters, essays and fan speculation. From this end of the millennium, he appears as a man out of time, which perhaps accounts for the skilled depictions of isolation and despair in his work. A troubled life, an early death—these are the makings of a horror legend. For the HPL initiate, the place to start is The Best of H.P. 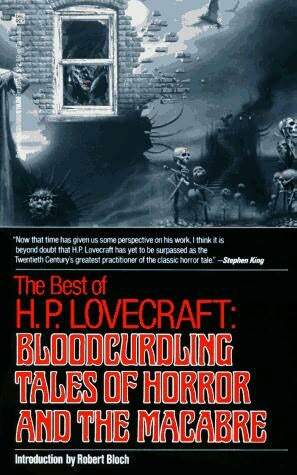 Lovecraft: Bloodcurdling Tales of Horror and the Macabre. This collection of 16 of his best-known stories proves his staying power. My favorite is “The Outsider,” a dark epic of self-discovery. This story speaks to me as few stories can, and I believe this is Lovecraft at his most earnest. “Pickman’s Model” and “The Picture in the House” explore the intersection of art and madness. For HPL, this crossroad manifests in the form of weird fiction, but I can’t help but wonder at his deeper intentions in these stories. Likewise, “The Music of Erich Zann,” one of the finest pieces of horror fiction I’ve ever read. In a forgotten section of, presumably, Paris, a young student rents a room beneath a master violist. The man performs strange melodies at all hours of the night, and when the narrator learns of their origin… well, the story takes a classic Lovecraftian turn, but with more subtlety and greater effect. From a craft perspective, this is one of his best works. From a reader’s perspective as well. And I’ve got to touch on “The Rats in the Walls,” as great a depiction of psychosis and inherited guilt ever written. Be warned: It’s usually easy enough to overlook some of Lovecraft’s subtle racism, but it sits front and center in this story, which makes it tougher to swallow. If you can stomach that, you’ll enjoy this thoroughly gut-churning tale. Then, of course, there are the mega-hits: “The Call of Cthulhu,” “The Dunwich Horror,” “The Shadow Over Innsmouth.” There’s not much I can really add to the discussion of these classics, other than to chuckle (and sometimes cringe) at Lovecraft’s story titles. He had a penchant for the noun-prepositional phrase structure favored by the pulps (“The Colour Out of Space,” “The Haunter of the Dark,” “The Thing on the Doorstep”) or a variation thereof (“At the Mountains of Madness,” “Beyond the Wall of Sleep”). The greatest thing to happen to Lovecraft fans in recent years is the H.P. Lovecraft Literary Podcast, a thoughtful and well-produced audio chronology of his work. They started in 2009, discussing one story at a time (one episode for shorter works, multiple episodes for longer ones), and came to the end of his oeuvre earlier this year. They offer all kinds of goodies for Miskatonic alumni, including professional readings, old episodes and original works. Best of all, though Lovecraft has been gone 75 years, his mythos live on. There are numerous collections of Lovecraft-inspired fiction, such as Future Lovecraft and Shadows Over Baker Street (an HPL/Sherlock Holmes mash-up). Writers such as Michael Chabon, Stephen King and Neil Gaiman have all contributed to the ongoing mythos. And there is a new crop of writers adding to the legacy all the time. I highly recommend checking out the Lovecraft eZine, which publishes great artwork, weird fiction and weekly Web updates and video chats.